What better place to stage your day of days than in Puerto Rico? Known as the Isle of Enchantment, this U.S. territory make a fabulous choice as the place to begin your life together. And, the expertise of Enchanted Honeymoons travel agents will make your special day totally unforgettable and hassle-free. As Omaha travel agents specializing in destination weddings, we know Puerto Rico inside and out. We’ll be there for you every step of the way, making your big day perfect. You’ll have a wide variety of options of magical destination wedding packages in Puerto Rico to choose from, and we can help you make all necessary arrangements, from booking travel and wedding venues to special touches for your ceremony. Your stay in Puerto Rico can be filled with pampering at the spa, tanning poolside, or living it up in the sun and sand. Or if you choose to venture out and enjoy the adventure that awaits, there is a resort in Puerto Rico to meet your needs. Choosing an all-inclusive resort makes it easy and convenient to enjoy your wedding trip to the fullest. Package your room, meals, and activities together and only pay one fee by staying at one of the many fabulous all-inclusive resorts along the picturesque beaches in Puerto Rico. Live in the lap of luxury or discover what the unique countryside has to offer—all at one inclusive price. Romance should be on your wedding agenda and Puerto Rico delivers. We know all the resorts that cater to your romantic notions. Stroll down a secluded beach or enjoy a special gourmet meal for two, all wrapped up in a world that contains only the two of you. Let your guests enjoy island paradise a little longer by choosing a resort that caters to everyone. Keep the celebration going all through the week by selecting one of the many options in family-friendly resorts. We’ll help you find one that meets everyone’s need, from kids to grandparents. What could be more romantic than saying your vows amid Puerto Rico’s tropical splendor? A wedding ceremony with waves gently crashing onto the sand and palms swaying gently in the breeze creates an unforgettable ceremony. A glorious Puerto Rico sunset is the perfect ending to your perfect day. Getting married in Puerto Rico is the best of both worlds. Although you get to enjoy the ambience of an exotic locale, it’s just as easy to get married in Puerto Rico as it is in your home state. You and your guests do not require a passport to travel to this U.S. territory, and the requirements for marriage certificates are relatively easy to meet. Best of all, your Enchanted Honeymoons travel planner can help you make all necessary arrangements for securing your marriage certificate. Nestled in the northeast Caribbean, Puerto Rico sets the stage for a romantic destination wedding. Plus, there’s a long list of things to discover in Puerto Rico. Whether it’s going on a spectacular adventure, taking in the scenery, snorkeling, or shopping and dining, you can find exactly what you’re looking for. 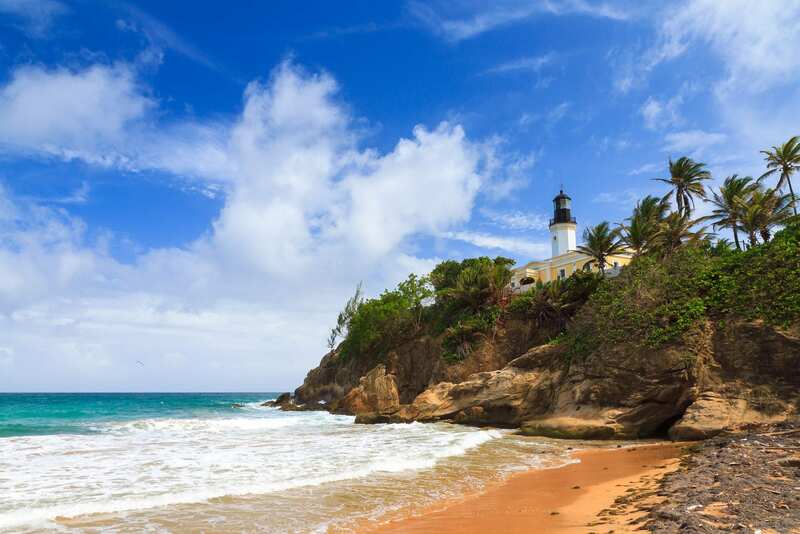 Check out some of the attractions of Puerto Rico below. Boasting centuries-old architecture, cobblestone streets lined with gas lights, and sophisticated dining on Fortaleza Street, Old San Juan offers something for everyone. Tour forts built in the 18th century, or take a romantic walk at sunset through the Paseo de la Princesa and enjoy the Raices fountain. There’s exhilarating nightlife to enjoy (get ready to up your salsa dancing game) and you can tour the home of Ponce de Leon. Located on the slopes of the Sierra de Luquillo mountains in northeastern Puerto Rico, this U.S. National Forest offers many activities. The landscape is stunning and is the only tropical rain forest listed on U.S. soil. Nature lovers will enjoy hiking through the forest which is also a nature preserve. As many as 23 species of trees and plants in the forest can be found nowhere else. Camuy River Cave Park features an impressive network of caverns made up of limestone rock formations. Carved out by the Camuy River over the course of the last million years, the Camuy Caves are a crown jewel in the natural wonders to be found in Puerto Rico. It’s the largest underground formation in the Caribbean and one of the largest in the Western Hemisphere. Hikers enter the caves by descending 200 feet down a well-maintained trail and will be thrilled by the stalagmites and stalactites found in the massive caverns. A truly amazing experience, Vieques Biobay features a wealth of bioluminescence. Glowing microorganisms surround you as you canoe through mangrove trees into the bay, making the water and sky emit a mystical blue glow. It’s best to experience the Veiques Biobay on a moonless night to enjoy the full effect of the glowing life forms around you. Are You Interested in a Puerto Rico Wedding Package? We’re Here to Help! As Omaha travel agents with extensive experience helping couples find destination wedding packages, Enchanted Honeymoons is your ultimate resource for planning your wedding in Puerto Rico. Give us a call at 402-281-3022 to learn more about this beautiful island, our wedding packages, and ask any questions you may have.